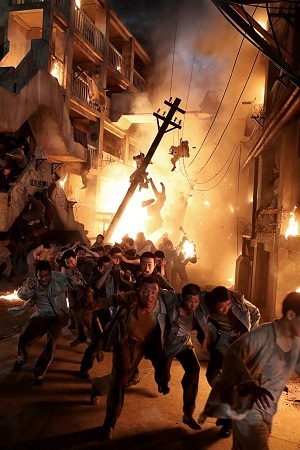 Battleship Island follows a massive escape attempt by hundreds of workers from a forced labor camp located on Battleship Island during the Japanese occupation of Korea at the end of World War II. Battleship Island is the very highly anticipated film coming from hit director Ryoo Seung Wan. It premiered in Korea last week and broke all kinds of records including setting the record for highest opening day with over 970,000 tickets sold. It then released this weekend in over 40 cities in the US and Canada. 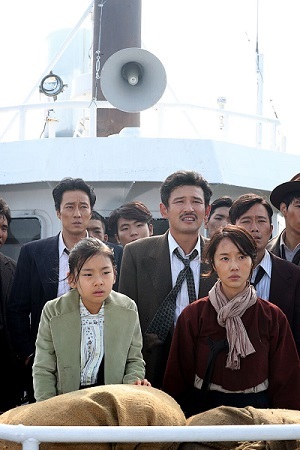 It is a dark and gritty war film that depicts a very difficult period in Korean history. In this movie, we see the terrible situation that leads to so many Koreans ending up in a forced labor camp under Japanese control. The living and working conditions are abysmal on the island. The men do hard labor in the mines while the women end up as comfort women for the Japanese. It’s a horrible place to be with no one being able to leave. The movie had a large budget which was very evident from the sprawling and realistic sets. There are plenty of impressive shots that depict the large scale of the labor camp and how many people were living in such deplorable conditions. The mass escape attempt also feels very grand and is very intense. As one would expect in a film of this nature in a war time setting, it is very violent with a lot of fighting and killing. It’s not for the faint of heart as this goes on pretty much throughout the entire movie. I think what Battleship Island does best is its depiction of the situation on the island as a whole that results in a hopelessness for the people. That then sets up and drives the action packed “prison break” style story that follows in the second half of the film. The overall narrative felt a bit all over the place at times. This also isn’t the sort of movie where you get a lot of bonding time with the characters. There’s just a lot going on and everyone remains pretty one dimensional as they play their set part. But the harsh conditions they face helps to create sympathy for them and their situation. 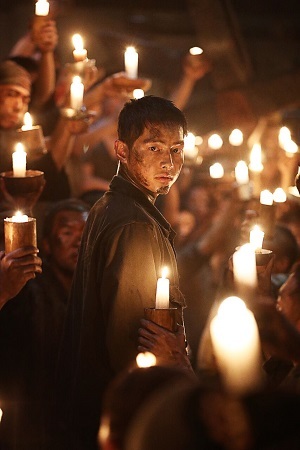 Admirable performances were delivered by both Song Joong Ki as an independence fighter sent to rescue someone on the island and So Ji Sub as a rough street fighter. We definitely didn’t get a lot of opportunity to dig deep with their characters, but they played their roles perfectly. 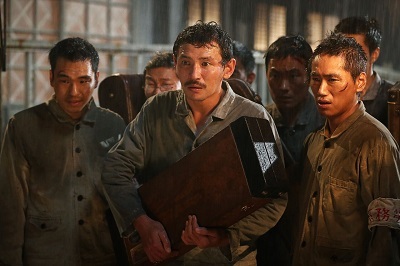 Some of the most touching parts of the film came from the relationship between a band leader (Hwang Jung Min) and his daughter (Kim Soo An) who both end up in the labor camp. Their story really brought the sad situation the people faced to life and added some needed warmth. 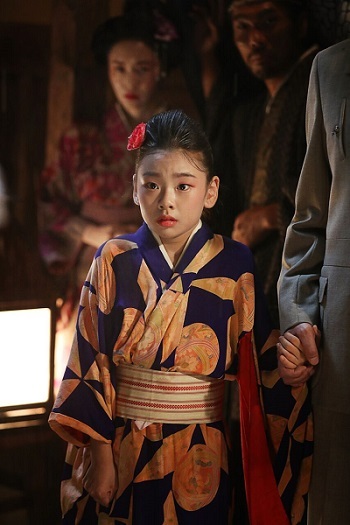 Kim Soo An was incredibly moving and really brought an innocence to the story. They also add a bit of levity amidst an otherwise serious film. I would recommend Battleship Island for fans of war movies or prison break style stories. While the subject matter is quite depressing, there is still hope. There’s also plenty of action and great cinematography coupled with a solid cast. I found it to be pretty enjoyable overall with enough positive elements to be a worthwhile watch. This entry was posted in Reviews and tagged Battleship Island, Hwang Jung Min, Kim Soo An, kmovie, korean movie, So Ji Sub, Song Joong Ki. Bookmark the permalink. I’m so excited you got to see the movie! I knew I couldn’t deal with the violence and the scenes of the mines. I’ll have to wait until there is a FF button handy. Just curious….how did the audience react to the movie? I’ve also heard it was very nationalistic–what did you think about that aspect? And do you think the violence could have been scaled back without affecting the film’s message? I pretty much always think the violence can be toned down in a movie and still get the message across if portrayed right. But I thought the violence was typical of a film like this and with that in mind, I thought it definitely painted the picture of of life on the island and the brutality well. And I would agree it was very nationalistic. While it mostly paints the Japanese as bad, I didn’t think it was overdone. Plus, I’m pretty used to war films from whatever country it may be portraying one side as the villain. So I personally didn’t find it an issue especially considering the main themes of the film were portraying the dire situation on the island and then an action packed escape. I also watched the movie to do an editorial review, so there was just me 🙂 I hope you get to check it out soon!